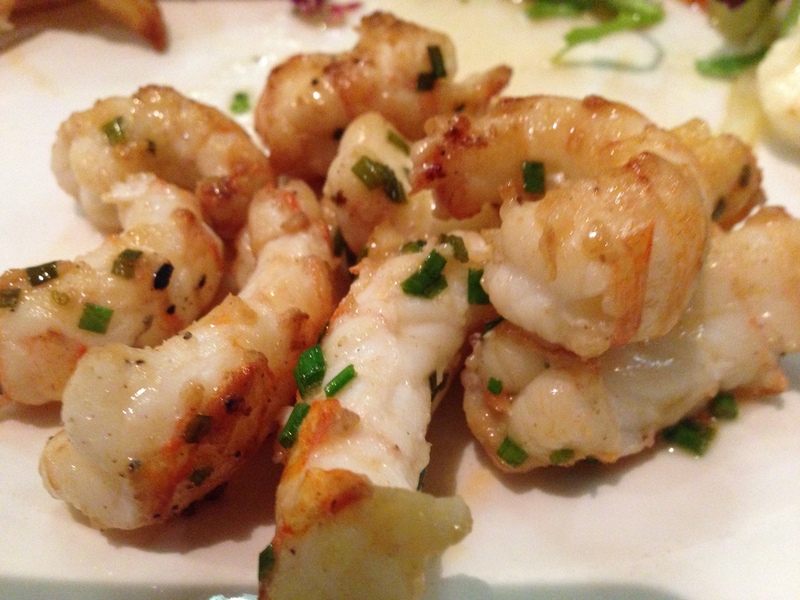 The object of my visit: To trace the sea-to-plate journey of Nephrops norvegicus, – the Langoustine, the Norway Lobster, and to those enjoying the breaded tails thereof, Scampi.To the fishermen of Peterhead they are just “Prawns”. The man I’ve come to meet is Jimmy Buchan; an iconic, exuberant, larger than life character and Peterhead fisherman and resident. Some of you will recall, no doubt, his exploits, as filmed by a BBC film crew for the series “Trawlermen” My trip as suggested, has been planned around the story of his “Amity” branded langoustines, (reflected in his vessel’s name – Amity II) but from the outset, I’m made aware, that this subject is merely an incidental thread to the enthralling, but deadly serious story that’s about to unfold in front of me. I get a text: “Have you ridden into town yet?” and at this point I confess the Aberdeen evening rush hour is hampering my onwards efforts to reach him. A call follows: “My vessel sails at 6.30 for her next prawn trip. Can you get to the Harbour by then? If so we’ll get you aboard for a quick tour before she puts to sea” It’s all the incentive I need and with a knowing nod from my taxi driver, we speed on ahead and swing onto the port’s Albert Quay with minutes to spare. Jimmy’s there to greet me and without further ado, I’m ushered on board taking immediate care not to disappear down a hatch or companionway. Once aboard, it’s straight up to the wheel house and here, I’m introduced to Jimmy’s young skipper, Philip Reid who at 28 has been entrusted to the care of Jimmy’s beloved Amity II, having gained his skipper’s ticket at the tender age of 23. I get a whistle-stop tour of the boat from top to bottom, wheel house to engine room, galley to fish room, sorting table and ice maker. It’s explained to me as we move round the vessel, that in 2012 Amity II underwent a major refit. Faced with the dismal prospect of a decommissioning incentive (applied for) Jimmy dramatically altered course and in a heart searching moment of clarity and vision, turned the application round into a major overhaul and improvement programme which would secure her fishing future for the next 20 years. Every bit of the ship was thus scrutinised in a bid to promote and ensure efficiency and safety. 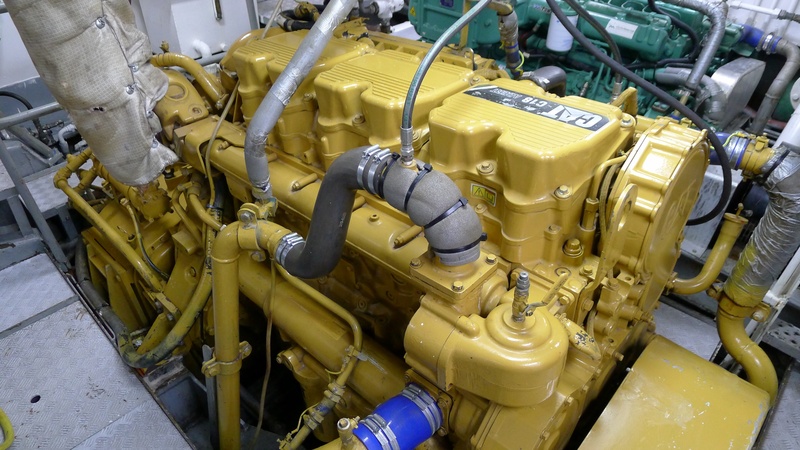 Foremost on the list being the power unit, an impressive 500kw Caterpillar diesel, now down rated to a new 400kw engine with greater fuel/power efficiency.When coupled with a whole new driveline, (gearbox, drive shaft and propeller), it knocks an impressive £50k/year off an eye watering £227k annual fuel bill. Crew safety features massively and one member, Danny has just returned aboard after a period of absence having lost a finger to a jumping “clump” (a heavy,weighted, towing block that couples both parts of the Amity’s “twin trawl”). Danny grins as shows me with a sort of visceral pride, his only recently healed and still tender stump. “You have to invest in your crew” admits Jimmy. “These guys are no good to me if they’re not 100% confident in the boat (and the skipper,”) he adds wryly. Seeing Danny’s injury drives home the stark reminder of just how incredibly dangerous an occupation offshore fishing is. A Health and Safety nightmare, where work that is at best, violently hazardous, is compounded and exaggerated by Mother Nature, where each trip can be a potentially life-threatening voyage. 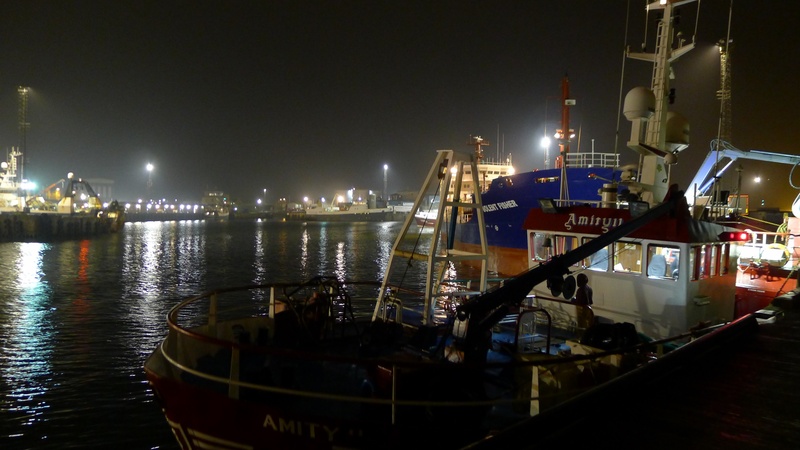 Tour complete, we disembark and watch quietly from the end of the Harbour wall as Amity, assisted by a gentle nudge from her port bow thruster, slowly glides out into the black North Sea night. We throw our waves to Philip and his crew and although he doesn’t let on, Jimmy is secretly wishing he was aboard. On the short journey back to my accommodation, the Buchan Braes Hotel, he sets out my packed agenda for the following day: Fish Market followed by a tour of the newest trawler in the fleet and time spent with the various port characters, who I discover later are to further colour in, my already-forming picture. 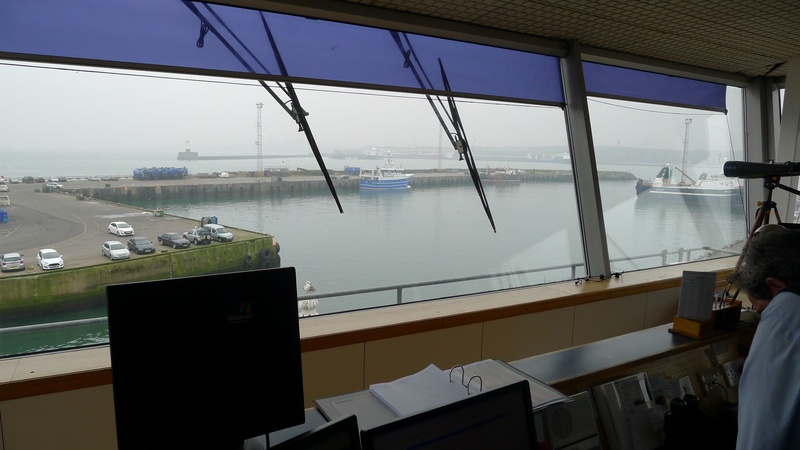 The next day dawns exceptionally early, as a raucous and vocally challenged herring gull announces the first glimmer of the new Peterhead day, in a shrill and alarming manner by my window. Further sleep seems futile and I get myself ready for Jimmy’s arrival later at 7.15. He’s of course bang-on-time and without ado we head again for the harbour. I’d spoken the previous evening of one of the other fishermen portrayed in the Trawlermen series and his whereabouts. It’s only a matter of minutes before I’m introduced to the now ex-skipper but newly designated Harbour Master, Sandy Watt, formerly of the “Fruitful Harvest”. Sandy leads us to the Fish Market where in the lobby, a wall-mounted monitor shows a computer graphic, which he explains, in his beautiful and lilting Doric accent, indicates the size of the day’s market, a whopping 4700 boxes. Having donned the appropriate gear: white market coats, hats and boots, we arrive on the market floor to an already buzzing atmosphere of resonant auctioneer’s calls and mumbling merchants. The sight that greets my eyes is, to a seafood addict, manna from heaven. Sandy leads us to rows of boxes that instantly indicate the health status and class size of fish currently being landed. 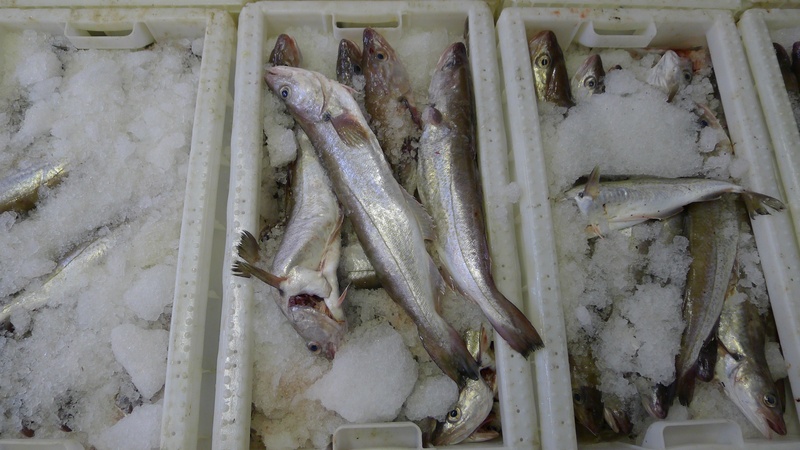 Incredible-sized whiting (Merlangius merlangus) 3 + kgs, massive ling (Molva molva) that lollop over the ends of the boxes, their paddle tails touching the glistening market floor. 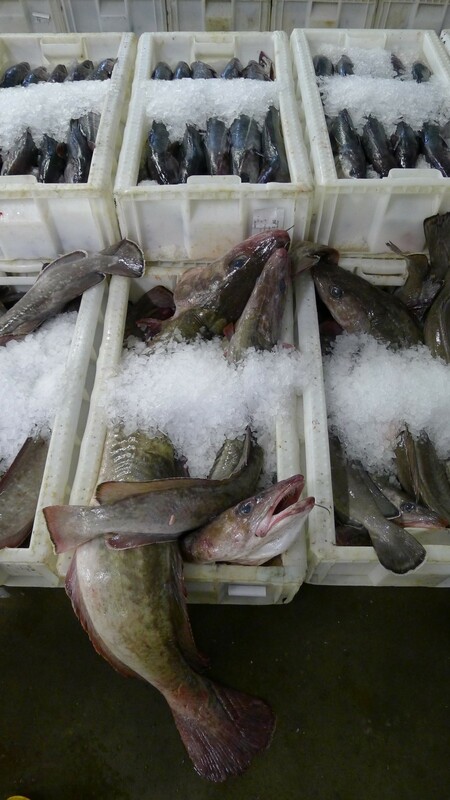 Huge hake (Merluccius merluccius), a species unheard of on the North Sea grounds, until relatively recently, and of course the fish that constitutes a staggering 75% of Peterhead’s trade, the Haddock (Melanogrammus aeglefinus) the preferred battered companion to Scottish chips. I’m drawn into a conversation with a local merchant who announces with considerable aplomb, his intention to purchase the hugest of the ling. I observe remotely, as the deal is done and his buyers tickets scattered over the boxes. Also atop the fish are labels indicating the name of the boat that caught them and the date. Sandy is quick to point out that these are a new feature of the market only becoming mandatory the day before. “It’s a great idea, for the merchant to trace the fish back to the boat, but it’s already flawed, the date reflecting the landing and not the catching” Sandy goes on to explain about the different fishing methods employed by the Peterhead fleet and how they relate to the quality of fish landed. Single Trawl, (two doors) (Otter Boards), Twin Trawl (two doors), Pair Trawl (two boats), Seine Net. Having converted his own boat from a single trawl to a seine net some years before he retired, he is at pains to tell me how he couldn’t believe how the quality of fish improved when landed. 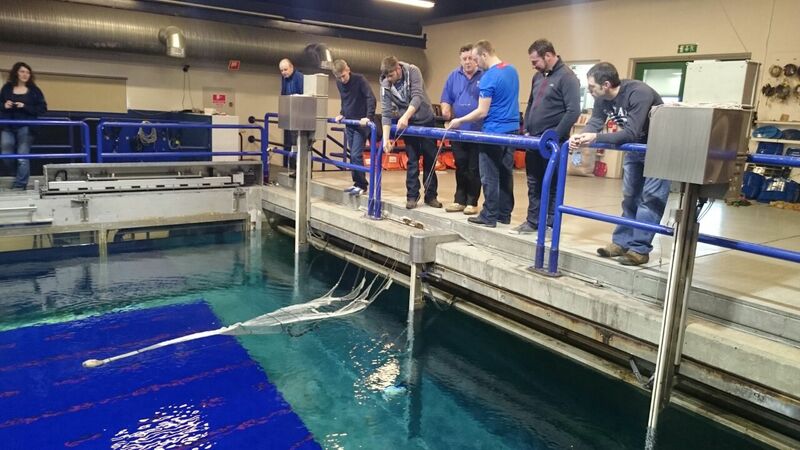 ” It was a revelation to see the difference in condition of the seine-netted fish compared to the trawl” he observes. “For a start they were all alive but much brighter and the scales – scales everywhere! Some times too large a bag of fish in a trawl can result in tissue damage through compression and that is reflected at market”. Having watched the buyers come and go, Jimmy and I retire to the social epicentre of the harbour, the Dolphin Cafe, where I start to question further the methodology he employs aboard Amity and his hopes and vision for the future. One burning question I have is that of the impending Landing Obligation for demersal fish in 2016 and how without enough quota he will deal with his by-catch? Innovation is the answer and this is where I begin to understand that entrepreneur fishermen like Jimmy are far more in tune with their quarry that science and media would have us believe. In catching his Prawns, Jimmy obviously can’t help but catch other fish species that are there in number, feeding on the nephrops. He recognises that, although a proportion of these can be landed (and which he has quota for), juveniles and other by catch stand a far better chance with some ability to escape the clutches of the cod-end. To facilitate this, he has designed a modification to the trawl net whereby the “cover” – the overhang of the top of the net above the foot rope (traditionally about 10-12 feet) is reduced down to 2 feet. Beyond the cover, the mesh or “yarn” size is also increased from 100mm-300mm, giving even more chance to escapees. It works, and coupled with a further escape panel situated nearer to the cod-end, Jimmy has already noticed a significant reduction in by-catch reaching the sorting table. Further efficiency can be achieved by reducing the net opening height. Ordinarily, this type of trawl would be fished with the top of the net, at the mouth, about 6 feet above the sea bed. Reducing this distance by half, ensures again, that by-catch species trapped by the trawl are kept to a minimum. Taking into account the considerable investment and planning for the future, how does he see the question of succession being addressed in an industry where new potential skipper entrants are scarce? The reply I get is as positive as it can be. “Young guys do have a pathway, an opportunity, if they do want to come into our sector, but it’s the number of new entrants that’s worrying. The local lads are just not interested in a career in fishing.” For the few Bravehearts who do possess the desire for a life aboard, there exists, the Scottish Maritime Academy. Here they can learn the basic skills and knowledge required to set them on their chosen course, before finding a boat and a skipper. Seamanship, navigation, sea safety, net skills and communications are but a few of the subjects covered in the training, and Jimmy is eager to point out that Danny had just completed his GMDSS (radio operator’s) course there, whilst ashore in convalescent mode. Swiftly we move, on covering a myriad of subjects that surround the fishing industry, but I’m most keen to hear about the impending and exciting revelation that Jimmy, having entered the Grampian Food Innovations Awards has been shortlisted as a finalist in the competition which stands to be judged in only a couple of days time. 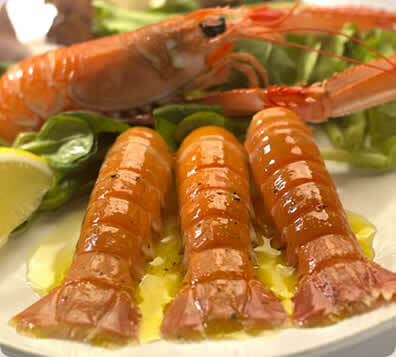 Jimmy elaborates: “Although I’ve been marketing my prawns as Amity langoustines for some while now, I’ve since recognised that I need to offer more choice and range to our established customers and to entice new ones to buy our products.” To this end, he has set up Skipper’s Choice -a new brand name for sustainable and responsibly fished Scottish seafood, which aims to provide the customer with a whole new taste experience.It combines the provenance already enjoyed but takes it a step further by introducing fish that people wouldn’t normally try. Three fish types all landed at Peterhead: haddock, hake and plaice, are all cold smoked and presented appealingly in a trio, which when vacuum packed, is then marketed as “wild-caught.” The idea is to use a well-known fish type (the haddock) and marry it with the other two for a whole new smoked fish experience. “A lot of the public will have never tasted hake or plaice before and we need to educate their palates” he remarks. Education is clearly a buzzword for Jimmy Buchan. 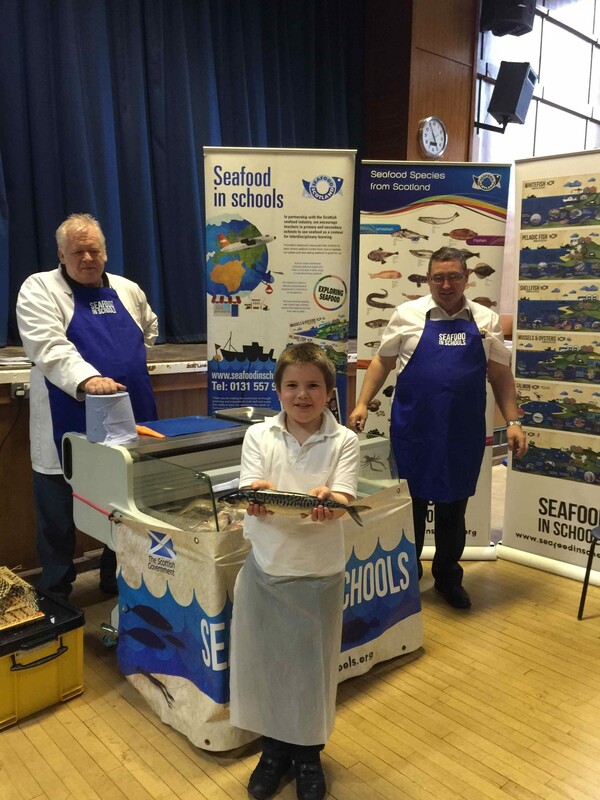 His eyes brighten and an assured smile sweeps across his face as I ask about his work with the Seafood in Schools initiative, from Seafood Scotland. 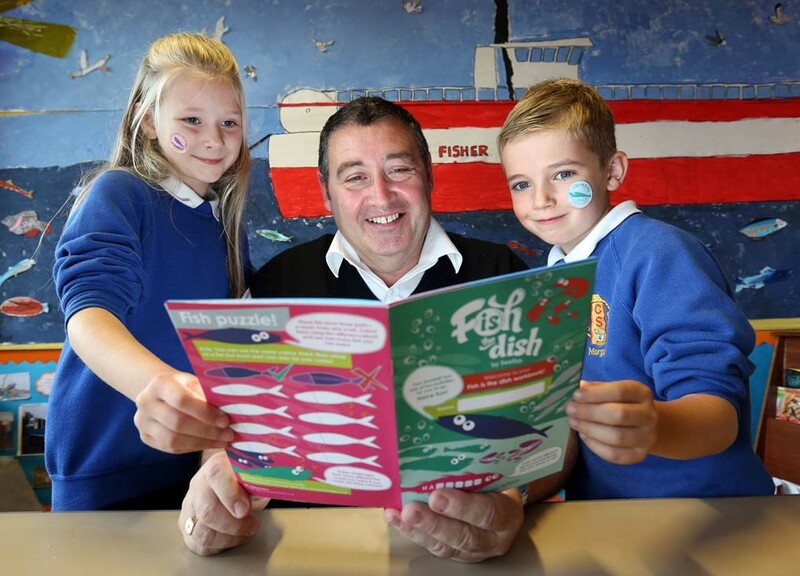 This highly exciting and educational project aims to introduce Scottish schoolchildren to the plethora of seafood that is locally available to them and to teach them about the journey from the boat to their fork. It affords them the chance to smell, touch and taste fish and shellfish in the classroom and engage with the skippers, merchants, processors and chefs to further their understanding of not only the craft of the industry, but the immense nutritional value and associated healthy lifestyle benefits. Jimmy is clearly a great ambassador and takes massive pride in going into the classroom environment to expound his subject to eager ears. The wonderful feedback he has had from staff and pupils alike, only go to reinforce what a hugely sensible and wholly necessary part of the education process this has become. Only recently, an Aberdonian school hosted 300 pupils in a 2 day session, which included fish identification and naming exercises. 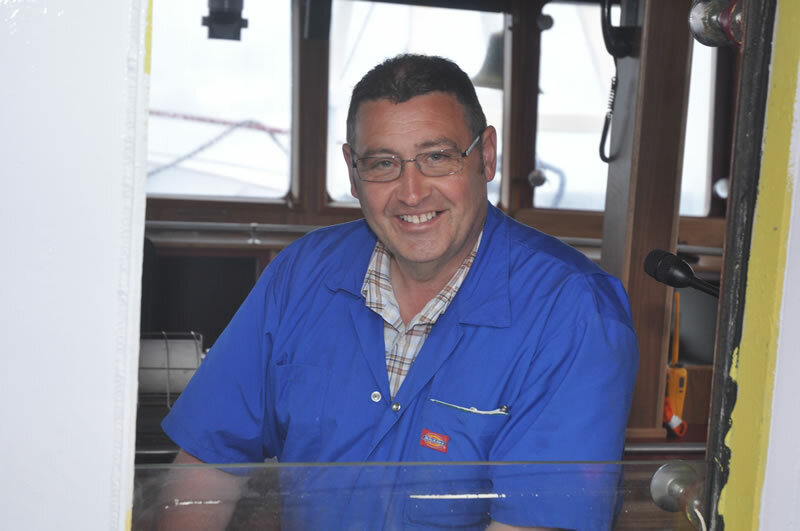 Jimmy laughs; “out of 64 species that swim around the Scottish coasts, we had them naming 40 of them during the first session. It’s quite incredible what we managed to teach in a relatively short space of time. They loved it and we had such kind and complimentary thank you letters, from them afterwards”. It’s obvious to me by now, that I’m talking to man who not only knows his subject inside out, but is fiercely intent on sharing his knowledge with future generations to secure a sustainable interest in an industry that means so much to him, his community and his country. Jimmy suddenly looks at his watch and realising he has business to attend to elsewhere, we leave the cafe and proceed back to the Albert Quay, where he has promised me a meeting with Sandy McLeman, owner and skipper of the Boy John (INS110) the newest and most state-of-the-art trawler in the fleet and sister ship to the Rosebloom (INS353) who pair trawl together and also owned by the McLeman family. 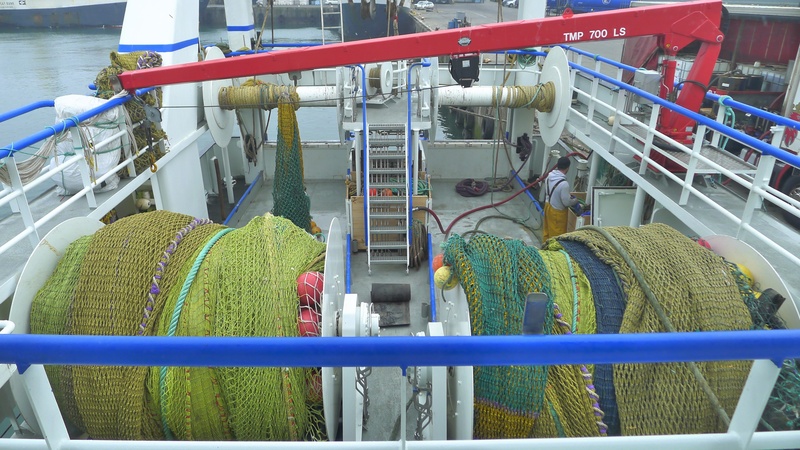 We hop aboard from the quay and make our way to the wheel house past two deck hands busily engaged in splicing a trawl warp. On up the companionway we clamber and into what I can only describe as a room akin to something out of the NASA Space Programme. An incredible sight greets, me in an array of screens and technology worthy of any high-tech industry. Here I’m introduced to Sandy, who after a brief banter with, Jimmy leaves me to chat to. I’m intrigued to know that, as his vessel is only weeks new, and having made such a colossal seven-figure investment, he has immense confidence in the future of the industry and the sustainability of the fish stocks he hunts. As we chat, Sandy divulges that not only has his family made the decision to invest in a new boat but also in the necessary quota to enable them to fish successfully and profitably. 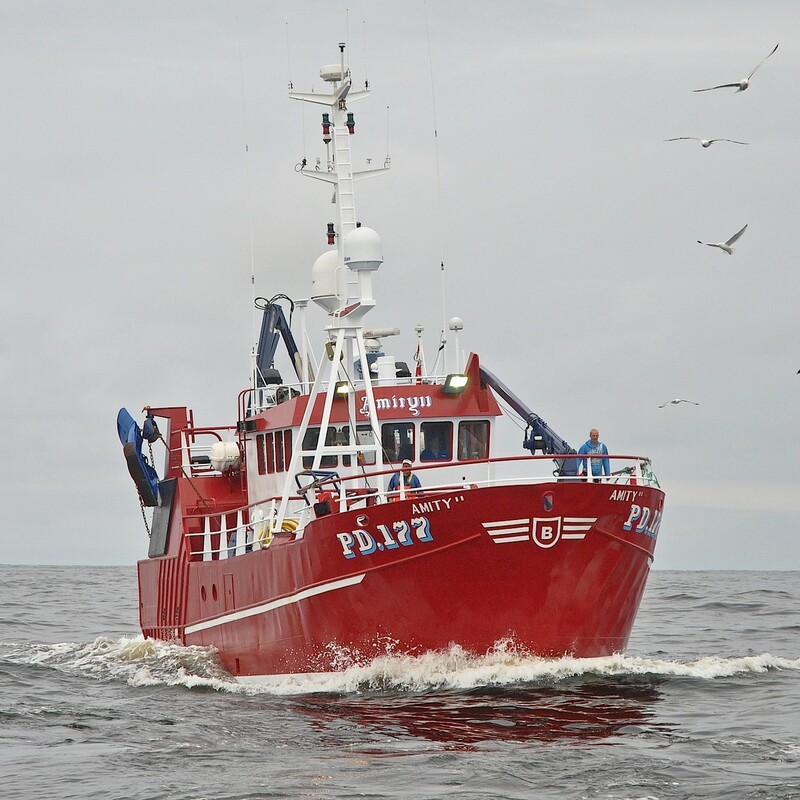 “We are allocated quota from our PO (Producer Organisation), but this alone is not enough for us to realistically fish with, therefore we have had to make the conscious decision to invest in extra quota which means more outlay, but with fish stocks being where they are in the North Sea at present, hopefully it has made commercial sense.” That last remark brings me to inquire about the biomass and class size of fish that they’re encountering at the moment and Sandy is under no illusion. “We’re definitely seeing larger fish now across all species and in numbers ” he adds. “I keep in close contact with the merchants and will talk to them while I’m at sea. In the case of haddock, it can often mean that I’m struggling to catch the optimum size of fish needed for the fish and chip trade. Too large a fish means the wrong fillet size and too much wastage.This will reflect directly in a poorer price/kg at auction. ” This I concur with, having witnessed exactly that, only hours before at the market. My next question is that of how the fleet are embracing technology, (all too evidently visible on the Boy John) and how that science is translated into results? Sandy furnishes me with a further in-depth insight as to the advances in fishing data interpretation that will hopefully help secure better and more workable legislation for them. 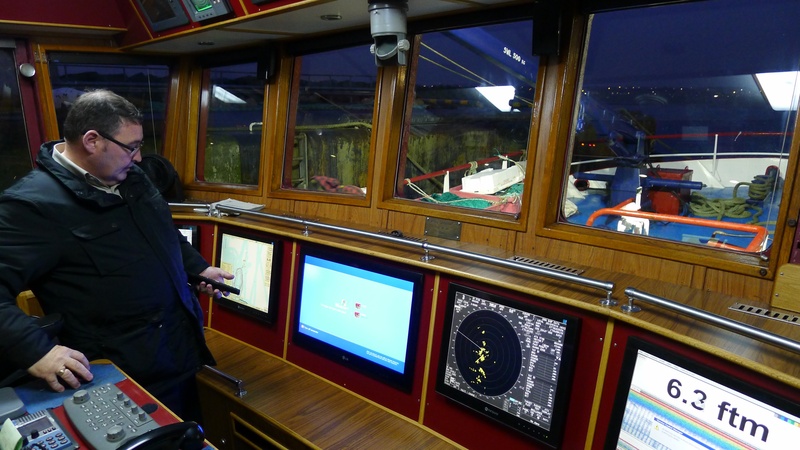 As on Amity, the McLemans have embraced the opportunity to work with Marine Scotland on a voluntary initiative to supply real-time data on how they are fishing. 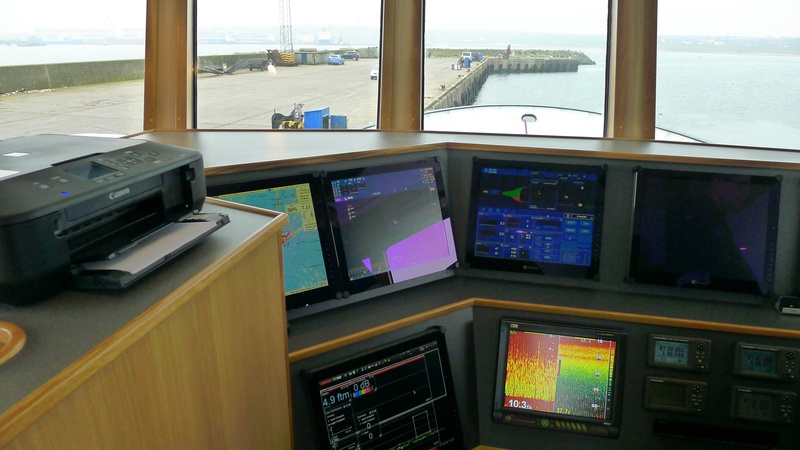 In reality this means CCTV cameras on board at various locations coupled with a “black-box type” hard drive which records the vessel’s every action. I ask Sandy whether this feels a little bit “Big Brother ?”. 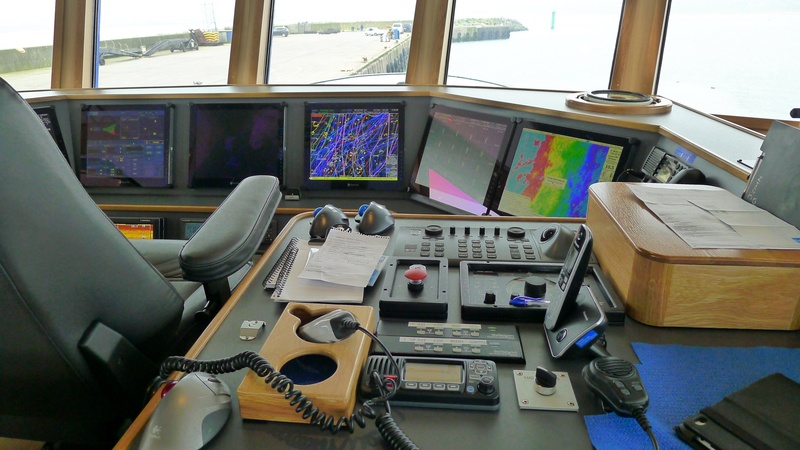 “Not really,” he confides, “If we are going to fish responsibly for the future, then the quicker we can supply accurate data and fully cooperate with the regulatory bodies, then the better able they are, to react to what is actually occurring in the sea. At present it roughly takes 2-3 years for any recorded data to be fed back, in order for decisions to be made, and by then the picture may have changed considerably”. He goes onto to explain that every 6 months by mutual consent, there is a debrief, when the skippers involved in the scheme have the opportunity to discuss progress and ask any questions.To me it just seems a logical mindset to have, for those wishing to protect and manage fish stocks in a responsible and forward thinking manner. As the day is marching on and I’ve been promised me a tour of the port authority control room, I thank Sandy profusely for his time and see myself off the Boy John as she prepares for another trip, once she’s landed her current haul of 1700 boxes of mixed white fish for the next morning’s market. Following a brief tour of the control room overlooking the bustling harbour with Sandy Watt and his colleague Joe, I retire, head buzzing, to the Dolphin Cafe and try to assimilate into copious notes the thoughts and findings that have arisen during my time here. Over a very fine lunch of Peterhead haddock & chips in the Dolphin, I write busily and await Jimmy’s return and my impending conveyance back to Aberdeen station. He duly appears again at our mutually designated time and we head off back down the A90. Glancing back to the port I look out East over the North Sea, with the knowledge that out there somewhere Amity II is conducting her first tow of the trip.Jimmy assures that he will text me later to let me know how Philip’s outing is progressing. We soon find ourselves chatting again and he enthusiastically tells me of Peterhead’s current and ambitious £40m port expansion and redevelopment plan, including a new market and improved landing facilities, a sign in itself that the Port does indeed have bright prospects lying ahead. “The catcher-hunter instinct doesn’t leave you,” he confides, “I have always maintained that we are also custodians of the sea. Its our job to protect not only our livelihoods, but those of future generations too. However, we need to retain the ability to react to opportunity and that’s not always easy when the public perception of what we do is constantly fuelled with misinformation”. I sense that in drawing my conclusions about this dynamic and fascinating place and its people, that statement really does sum up everything I’ve seen and heard during my time here. 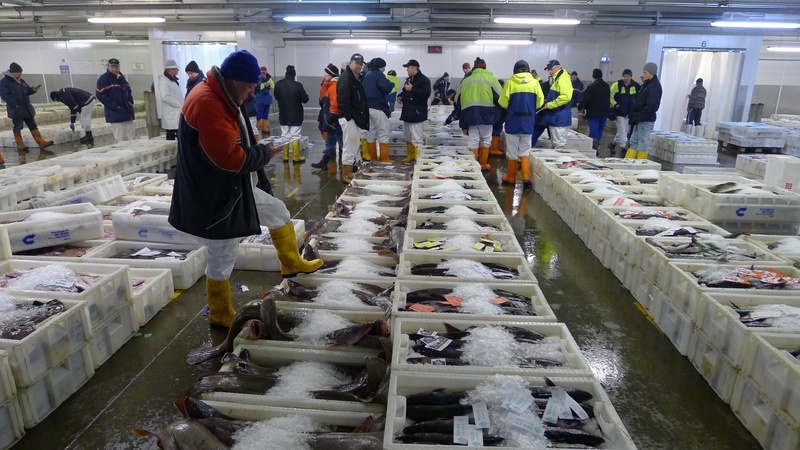 I went to Peterhead to research and write about the langoustine and how a sustainable and responsibly fished species can benefit the fisherman, the merchant, the harbour and the consumer through a process in which every step is defined by quality. I have no doubts about the responsibility and professionalism I have encountered here. At every level it has been demonstrated to me that the elements that go to ensure fish is made available to the UK population are of the highest standards and the security of the stocks and businesses for future generations are secured by progressive and forward-looking management and exacting criteria. 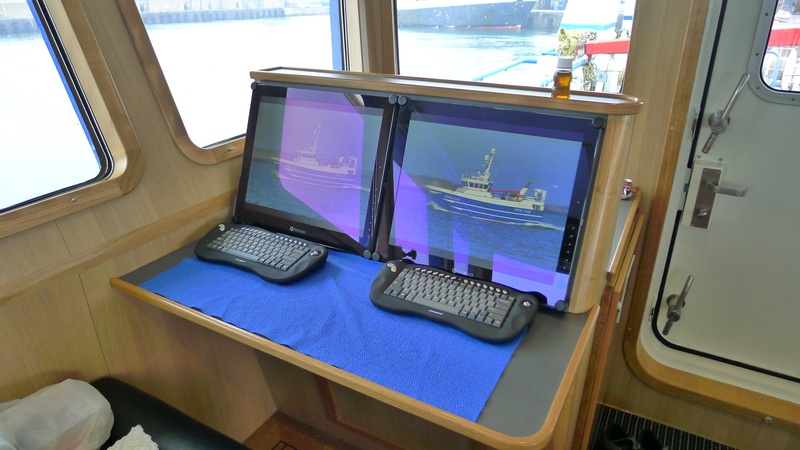 From the safety of the crew and the investment in technology to the willingness to educate and inform, the future of the offshore fishing industry in Scotland is assured. As Jimmy points out before I bid him farewell; “Oil and gas will come and go, but fishing will always remain.” Personally, I have learned so much in such a short space of time, far more than I would have ever imagined. My thanks must go to Jimmy Buchan and the men and women of Peterhead, who have made me so welcome.I shall return at some point I know and next time I will be visiting friends. 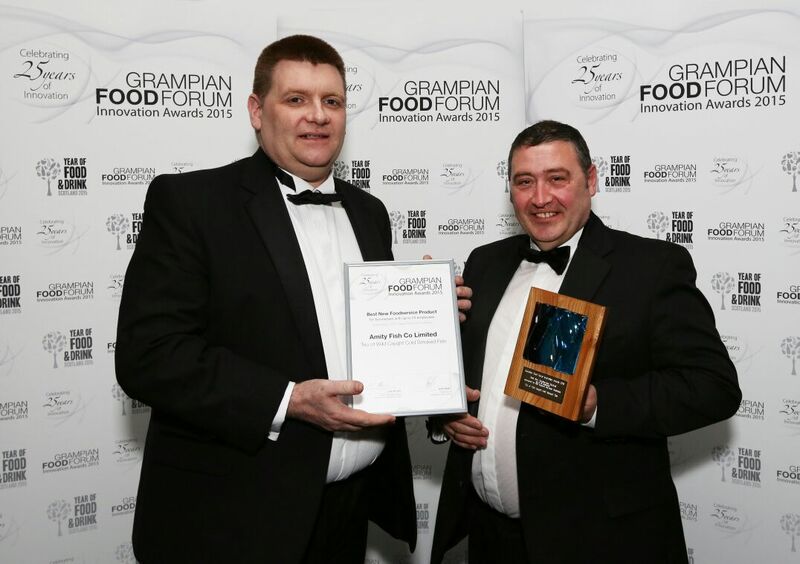 In the immediate days following my trip to Peterhead, I had an excited text from Jimmy one night announcing that he’d won the award best new foodservice product with his Smoked Fish Trio.